What goes into a TUSTING bag? While every TUSTING item is unique and hand-crafted, we follow the same eight steps every time to make sure you’ll enjoy perfect results. Find out exactly what goes into your TUSTING bag (other than mints, keys and wallet!) and how our expert team’s knowledge and skills come together to create these beautiful bags that are made to last. Our design ethos here at TUSTING is the same as it ever was: to offer our customers subtle but unmistakable luxury in the shape of something that’s built to perform and made to last. Inspiration can strike at any moment: a huge part of our creative process is listening to what our customers are passionate about, and being open to new ideas. There’s a solid rationale behind every item we create, wherever the initial spark of inspiration has come from. Fundamentally, we’re driven to interpret the trends we see into modern classics that will stand the test of time and become signature pieces for our customers. Turning the idea of a bag into something we can actually make takes extraordinary skill. Our expert pattern-makers can deconstruct a sketch or 3D model, visualising the component parts needed to create a beautiful new TUSTING product. That’s no mean feat when you consider that some of our bags comprise almost 100 separate pattern pieces. To those of us not endowed with this skill, the process can seem like a kind of alchemy. An initial idea is chopped into parts and woven back together in the mind of the pattern-maker, who devises everything from dimensions to assembly, and gives us the paper pattern pieces we need to get started. Arguably the single most important thing about any TUSTING piece is the character of the leather we craft it from. Every item is fashioned from full-grain leathers – premium quality hides that haven’t been sanded, buffed or snuffed to remove imperfections, and that retain the full strength, beauty and integrity of the leather. We meticulously inspect every single hide to ensure it has the right character and quality to be used in a TUSTING bag. Our leather experts check for marks or scars on the hide, and any invisible issues with the thickness and tensile strength, so you can be sure you’ll receive a flawless TUSTING piece that ages beautifully. We use a combination of hand and machine cutting at TUSTING. 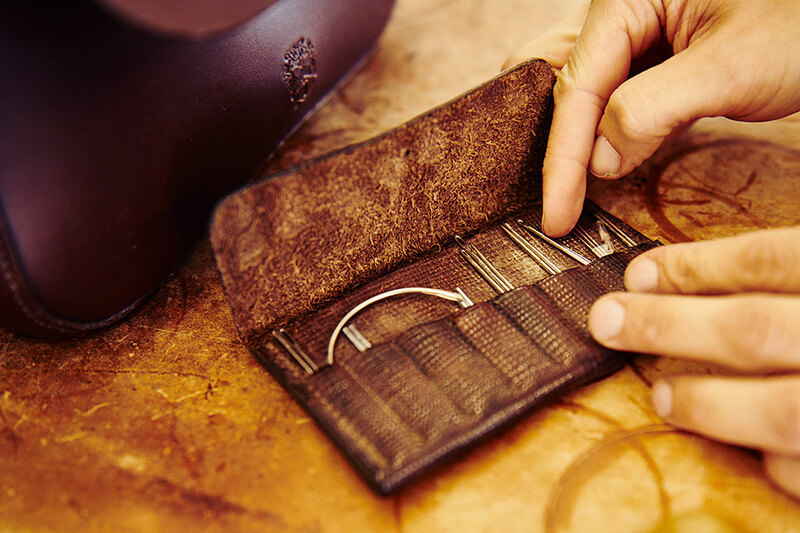 Our cutters use a razor-sharp knife to craft new pieces and one-off variants (such as bespoke leather bags) while our cutting machines make fast, safe and accurate work of the regularly shaped pieces we use. Even with machines, our cutters need a great deal of skill. Full-grain leather is a precious commodity and we use it carefully, getting as much as we can from each hide while navigating around any scars and flaws. And we only ever cut a single thickness of hide at once, so there’s no chance of a hidden defect making its way into a bag. Edge painting is undoubtedly the messiest, fiddliest job in the TUSTING studio, but it’s a vital one. If the cut edge of a pattern piece will be visible in a finished bag, the edges of the piece must be stained, sealed and polished in order to smooth the fibres of the leather and blend in the colour. Longer edges are carefully rolled past a tiny turning wheel laden with wet leather stain. But when it comes to trickier shapes, there’s no match for a keen eye and a very steady hand. Our current head edge painter has followed in her family tradition, taking over this role at TUSTING following her mother’s retirement. It’s the tiniest details that make a TUSTING bag so special – the way up to 100 pieces of our finest, full-grain leathers come together into a single, beautiful item. The skiving process tapers the edges of each pattern piece, removing some of the thickness of the leather from behind the grain so it can come together at the seams without creating bulk. This skill goes hand in hand with splitting, which involves shaving a certain thickness off an entire pattern piece to create a lighter, more pliable finished product. The splitting requirement is different for every bag we make – even a millimetre too far can ruin an entire pattern piece. Once the pattern pieces have been prepared, it’s up to our bench-workers to start putting together the jigsaw for our stitchers to sew. They lay out individual pattern pieces for our sewing team, who use the same kind of machines that revolutionised shoe manufacturing in the late 1800s. These are the perfect sewing machines for bags – they’re strong, and able to stitch through multiple layers of leather and linings. Guided entirely by the operators’ careful hands and keen eyes, and timed by their feet dancing on the power pedal to deliver as little as one stitch at a time, the sewing stage is never fails to enthral visitors to the workshop. To ensure that every little thing is taken care of, wherever necessary we return to the old-fashioned ways of the needle and thread. There are some jobs that just can’t be done well any other way, and we’re not for compromising on quality. There’s not much passion in the name Quality Control, which leaves us thinking we ought to come up with a new name for TUSTING’s eagle-eyed team of expert bag inspectors. Fully versed in everything that makes each one of our bags unique and special, from the stitching to the fittings, our team is here to make sure the bag you receive is as perfect as we can make it. After quality inspection, your bag gets a final brush and polish – and a fond farewell – as it’s nestled into its packaging ready to leave our home for yours.